After much perusing of Ravelry and so on, I settled for a free Patons lace cardigan. This was a brave move on my part because last year I has a disastrous attempt at lace knitting. (The full saga is reported here!) It did result, eventually, in a cardigan but it was a little snug on my daughter. I sent it to a charity shop in the end, which was pretty sad after all of the effort. Let’s just say that I spent more time frogging than I did knitting. I cast on the back and managed to make the eyelet ribbing. At the beginning, it looked like a particularly vicious moth had attacked my knitting, but after a few rows the pattern appeared and it began to look a bit prettier. I then switched needles for the main part, but I didn’t have 3.75mm so I went from 3.5 to 4.0 and it looked awful and was far too big a jump in size. Sensibly, I decided to order myself some 3.75mm needles from an eBay seller. Whilst waiting for my new arrival, I made good use of the many cables in my new kit and knitted the rib part of the back (which needed re working after the disastrous needle change), and both fronts, addingthe end caps to save my work. The new needles arrived the day after ordering, which was super quick, and I had also made a very good start on the cardigan by working the ribbing for so many parts. Last night I was able to start on the main lace pattern, which used a 24 row repeat. Needless to say, I had to read and then reread the pattern, memorising all of that was beyond me! 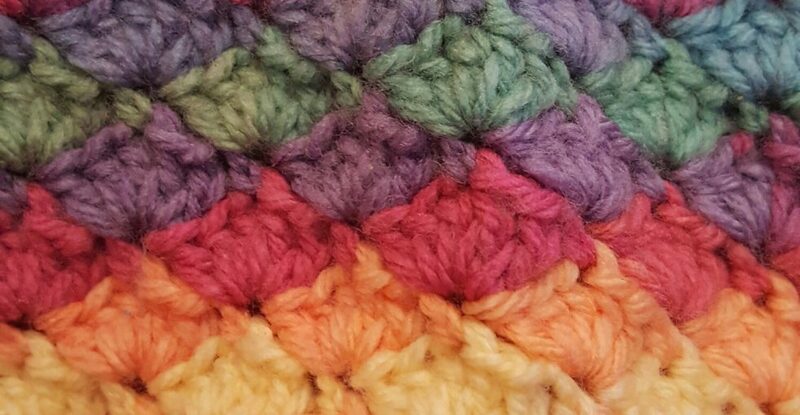 It was lovely to see a pattern emerging as I completed each row, and the pattern was fairly simple to follow. The only real error was missing a yarn over here and there and having to frog it back a row. It worked up fairly fast, once I’d got going. The choice of yarn was an interesting one. 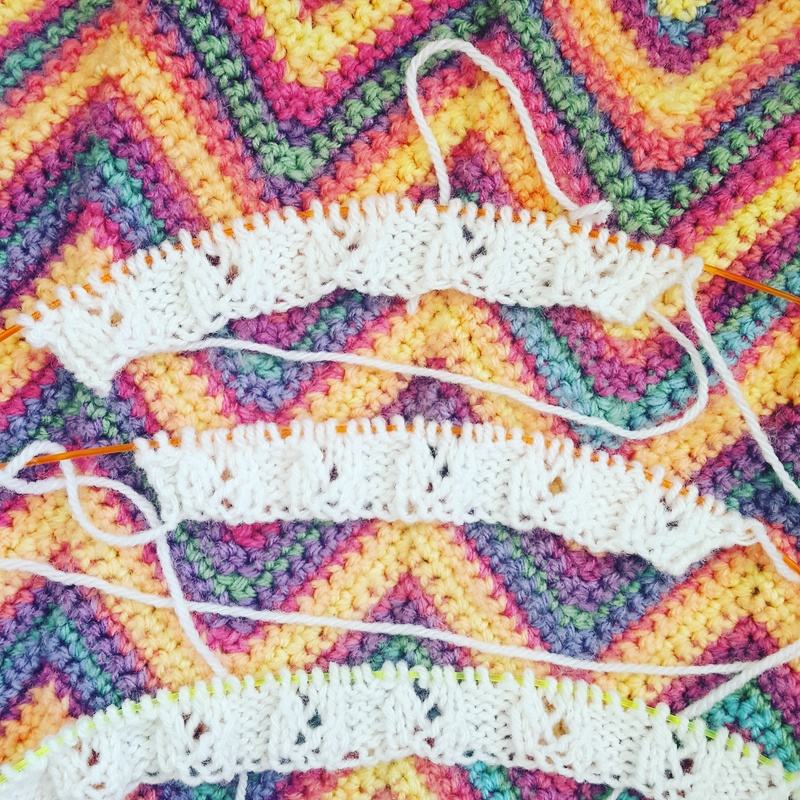 Last year I had a chat with a fellow blogger as my yarn was terribly splitty and didn’t look especially nice in my crochet project. The person I ‘spoke’ to said that some yarn I’d more suitable for knitting than crochet, and vice versa. This project is definite proof of that, as this yarn is working up beautifully. It’s 50% wool and 50% acrylic and knits like a dream, especially with my new needles! Hopefully I can maintain the pace and not make too many errors and there will be a completed cardigan ready for the summer! Thank you, I think it’ll be a while! How sweet of Mr. C! 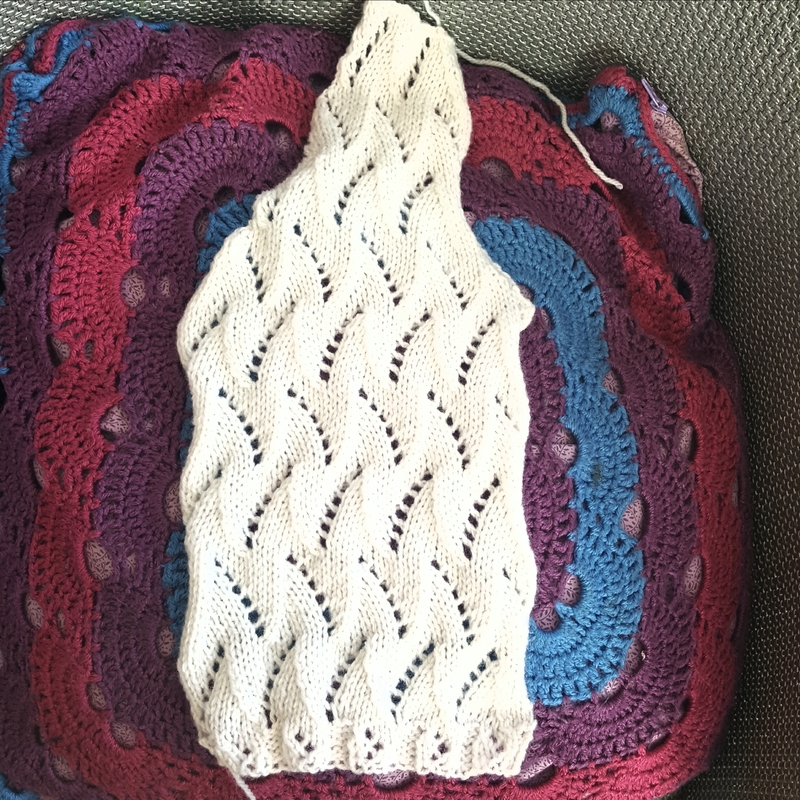 The cardigan is looking lovely! LOL. You went and spoilt that whole fuzzy image I had of at least ONE person who takes initiative to support crafting spouse!!!! absolutely beautiful! I am so impressed. I am sure. The finished work will be well worth it!! It looks lovely! I am envious. I tried knitting years ago when my sister was pregnant. I made a baby blanket and never did it again. I think its very beautiful but lol knitting wasnt for me. I LOVE Seeing it. Thank you, I love seeing it too and I often see patterns that I could never attempt. Thank you, they are amazing to knit with, I’m definitely getting more sizes of needle tips in the sizes I use the most. It’s looking beautiful so far! Thank you, this pattern is nice to keep track of as the holes change direction at row 12 so you can see where you’re up to! It is a big repeat though. Lifelines are a marvellous thing too, I need to use them more. Wow love that pattern, will look lovely when it is finish. I wish I could knit, I have tried but just can’t get the hang of it like crocheting. My nan can knit but don’t think she knows how to explain/show how to knit. As I have asked her and she said you knit one purl one and it’s like well how do I do that. Lol. I will keep trying though. Looks amazing! Can’t wait to see more. Thank you, I’m looking forward to making more! Thank you, I’m gradually adding to my collection. Some yarns are definitely better for knit or crochet and not the other.